One of the greatest things first-time GarageBand users discover and start playing with is the Loops. Loops are short snippets of music that you can use to beef up your recordings. Need a drum to accompany your guitar playing? Perhaps you want some string instruments at the beginning of your track? 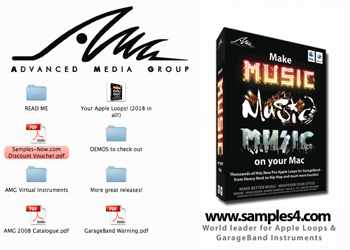 GarageBand has hundreds of music loops to use, built right into the program. What more could you need? Well, it turns out, if you use GarageBand often, you will need and want many more Loops at your disposal. As many as you can get, honestly. The more the merrier, as the saying goes. And that’s where Make Music on your Mac comes in. 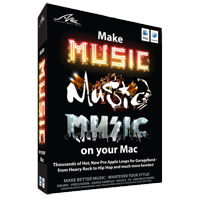 Make Music on your Mac (MMM for short) is a collection of over 2,000 loops that cover a wide variety of musical styles. It comes on one DVD, and importing them into GarageBand is as simple as dragging them to the open GarageBand applications Loops window. (Thanks Guy Serle) Once imported, you can begin using the loops in your music compilations. While some of the loops are neutral, in that they could be used in many different types of music projects, many are very specific, tonally. This limits those loops in a broader sense. But we are talking about music, and there is no such thing as a “generic” drum beat, guitar riff, or anything of the sort. It’s one of the draw-backs to building music with cookie-cutter sound loop files: there really is only so much you can do with the loops, and they will never replicate what is possible, what is in your head, by actually playing an instrument yourself. Fortunately, for people like me, who has no ability to play any instrument, the loops is a good starting point, or a solution to a specific musical or vocal need I have. So without a specific need, of a specific loop, how is one to decide if any package of music loops is one you should invest in? For me, I look at the variety of different musical styles in the package, the quality of the recordings, the “loopeness” of the sound files, and the number of them in the package. Weigh that against the cost (price) and you can come up with a pretty good idea if a compilation like Make Music on your Mac is worthwhile. With all that in mind, I would say yes, this is a well done package, worth your investment. *The ability to quickly and easily preview each loop before installing them in GarageBand, or opening up multiple folders to find and sample the sound files. *Simply put, the structure of the disc itself is a mess, and I hope they clean that up in future releases. It reminds me of badly done CD-ROM discs from the 1990s. That said, this is a good collection of music loops.